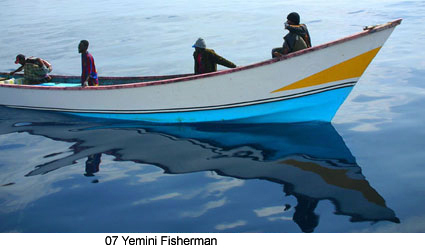 When Gunter and I embarked on our circumnavigation in 2000, I expected that we, of that small group crammed in between the Greatest Generation and the Baby Boomers, would merely be forerunners for the great migration to the world’s oceans to be created when the Baby Boomers retired. Certainly nothing, especially the dangers of the Seven Seas, would hold back that bold generation! That expectation has not come to pass. Advancements in navigation and technology and have certainly made long distance sailing safer than ever. But piracy throughout the world has made the oceans more dangerous. Our catamaran, Pacific Bliss, sailed the Strait of Malacca, with no problems, in 2006. During January the following year, we crossed the Indian Ocean from Thailand to Sri Lanka to the Maldives and on to the port of Salalah, Oman on the Arabian Sea. In Oman, we formed a flotilla of 5 yachts to transit the 660-mile stretch called Pirate Alley. Although the entire area seemed on Red Alert, with British and American coalition warships communicating over the airwaves and drones flying overhead to check us out, our biggest scare was being approached by local fishermen. (See my story, Passage Through Pirate Alley, on SCRIBD). We were relieved to reach Aden, Yemen and during our one week in that port, toured inland to Sanaa, the capital, now off-limits to tourists. On the back cover of my book, “Maiden Voyage,” I point out that “Every year, four times more adventurers climb Mt. Everest than complete a circumnavigation of the globe.” Imagine how this statistic has changed! With the killing of four American yachties by the Somali pirates, and most recently, the capturing of a Danish family with children on board, many of my friends and readers have been asking me what it felt like to go through the 660-mile stretch of sea called Pirate Alley. These short excerpts will show you what it was like for me. They are from my third book in the nautical trilogy, “In Search of Adventure and Moments of Bliss.” The first book in the series, MAIDEN VOYAGE, was recently published. March 7, 2007: When you’re getting ready to brave Pirate Alley, you want to do it with sailors that you can trust with your life. 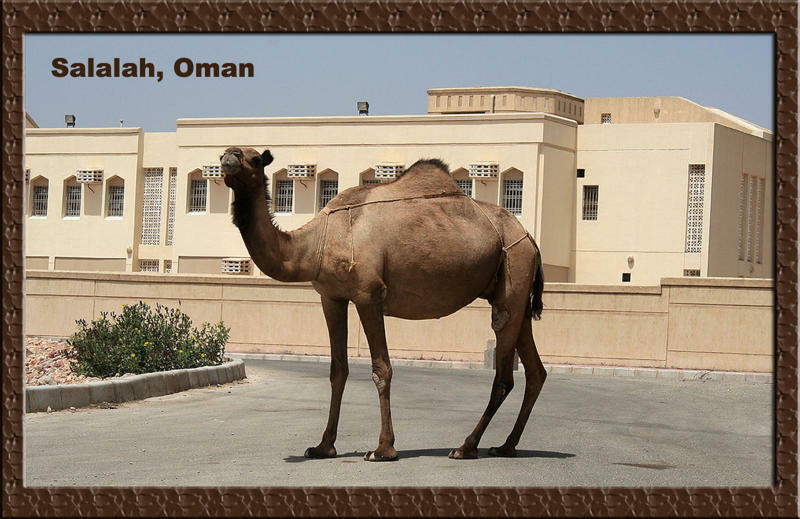 That’s why my husband, Gunter, and I formed the Camel Convoy along with four other sailing yachts—all on the same mission: to travel safely from Salalah, Oman to Aden, Yemen. …Haze envelops the rocky rugged coastline of Oman, but where we are—a stretch of sea in the Gulf of Aden heading southwest toward the Red Sea—the baby blue sky is strewn with fluffy clouds, soft as a baby’s pajamas. Oh, how I wish life could be that simple right now! I’d rather be cuddling one of my grandchildren than approaching the Danger Box of Pirate Alley, just four days away. It is getting to all of us. I too, am bored. Bored, yet tense. I am living that definition of sailing that I never understood until now: 90% boredom and 10% sheer terror. Like a volunteer fireman hanging around the station, I don’t want the fire to come, yet I’m fascinated by thought that it could. …The entire world out here is on red alert. It pervades the airwaves. It invades our psyches. It is buried deep within our bones. Yet nothing is happening in our little world. And we don’t want something to happen. The guys on the commercial ships, the captains of our sailing yachts, and most certainly the troops on the coalition ship, are all poised for action. I sense all of this bottled-up energy floating around, bouncing back off some invisible shield with no place to go. Yemen—Al Qaeda, Qat Chewing, and So Much More. Yemen is reportedly the least known region in Arabia. But it wasn’t always this way. King Solomon knew of this legendary land long before the Queen of Sheba visited his court with her gorgeous gifts. 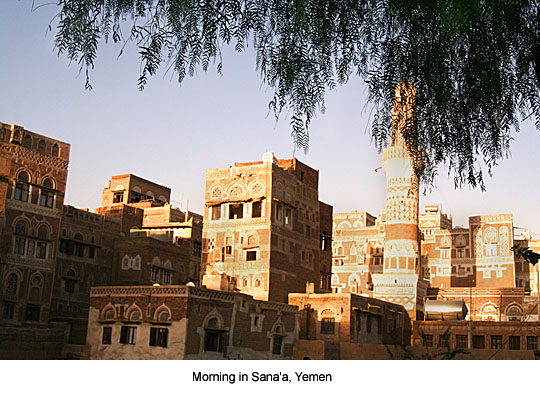 Yemen, along with Oman, is known for its rich resources of frankincense, spices, and myrrh. Great empires emerged there centuries before Christ. Here the Biblical Noah launched his famous ark. 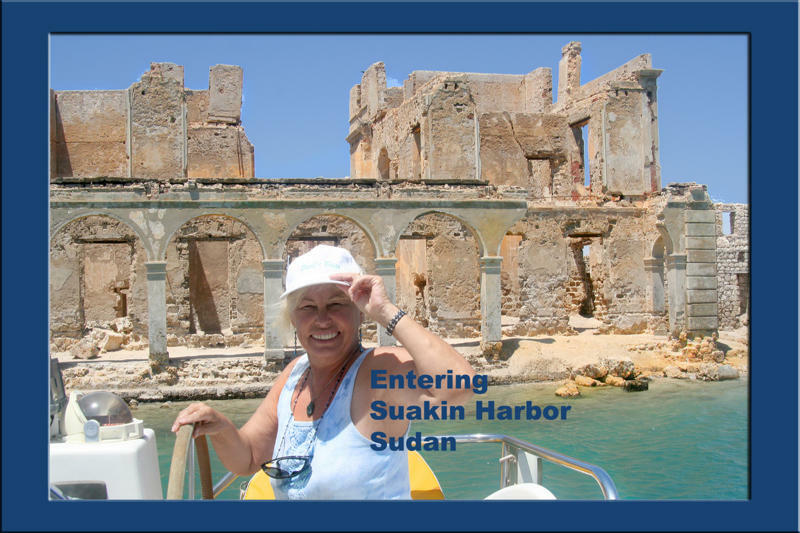 Yemen is still called the “Pearl of the Peninsula.”After Gunter and I and our crew, Chris, arrived in Aden and secured Pacific Bliss in the “safe” harbor in Aden (where the U.S.S. Cole was bombed) we left inland to tour Sana’a, Yemen’s 2500-year-old capital in the mountains. Old Sana’a is a UNESCO heritage site, one of the best preserved in the whole of the Arab world. Most work in Yemen stops at lunch time. This is the main meal, heavy, consumed with lots of fat to fortify the digestive tract against the onslaught of the bitter leaf. After lunch, the men go to the market to search out the best product within their budget; the longest branches, with tender light green shoots, are the most prized. 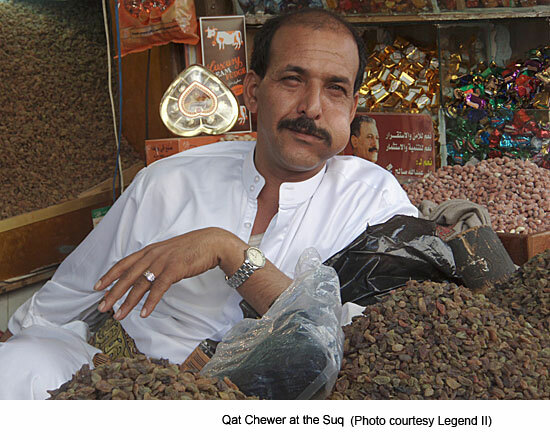 On average, a Yemeni can spend half his daily income on qat, so the selection process is crucial. Depending on its quality, the price of a qat rubta (bunch) needed for one “sitting” ranges from 100 to 5,000 rials (50 cents to $25.00). It is nearly impossible for the uninitiated to understand the difference between a bunch of leaves that sell for cheap and another that costs 20 times as much. The qat comes in different varieties, shapes and shades of green. Once they make their purchase, there comes the inevitable discussion among friends about whose home they will go to chew the qat. Those whose homes have a big mafraj (top story room for entertaining)—or at least a large diwan (sitting room) are the most popular. Each guest is expected to bring his own qat. The host then provides the mada’a (tobacco water pipe) and drinking water, soft drinks, or tea. Chewing is very dehydrating, so these liquids are essential. The chewers use their teeth (or a small gadget if they don’t have any left) to grind the leaves into a mulch, which is then stored in the cheek. After a couple of hours of stuffing the mouth, the mulch grows into a rather large ball from which the user extracts the juice and allows it to enter the digestive system. This scenario is repeated across the country, every day, in the homes of the rich and the poor. Chewing isn’t just an addiction or a way of passing time. In Yemen, it is a way of life. The airwaves have been quite full with the news of Somali Pirates these past few years. So it’s no wonder that whenever I give a talk about our world circumnavigation on a 43-foot catamaran, one of the first questions asked is about pirates. How did it feel sailing through Pirate Alley from Oman to Aden? We formed a CONVOY of five sailboats, but even then, it was scary. Some pirates shoot first, then take over the sailboat, especially if it is a nice one like Pacific Bliss that can be used as one of their “mother” ships. November 14, 2010: The Chandlers are Finally Freed! For the past 388 days, Paul and Rachel Chandler have been held captive when their sailboat was hijacked by Somali Pirates in the Indian Ocean. Relatives in Britain disclosed that one of the main hurdles they faced in their efforts to secure the Chandlers’ release was the refusal of some pirates to accept that they were not millionaires. Ransom negotiations broke down several times during the Kent couple’s 388-day ordeal because pirate leaders refused to believe that more money could not be raised. Reportedly, Mr. and Mrs. Chandler had ploughed their lifesavings into their 38ft yacht, Lynn Rival, and had even sold their house in Tunbridge Wells, U.K. to fund their retirement on the ocean.